The Rio–Antirrio Bridge (Greek: Γέφυρα Ρίου-Αντιρρίου), officially the Charilaos Trikoupis Bridge, is one of the world's longest multi-span cable-stayed bridges and longest of the fully suspended type. It crosses the Gulf of Corinth near Patras, linking the town of Rio on the Peloponnese peninsula to Antirrio on mainland Greece by road. It opened in August 2004. The 2,380-metre-long (7,808 ft) bridge (approximately 1.8 miles) dramatically improves access to and from the Peloponnese, which could previously be reached only by ferry or via the isthmus of Corinth in the east. Its width is 28 m (92 ft) — it has two vehicle lanes per direction, an emergency lane and a pedestrian walkway. Its five-span four-pylon cable-stayed portion of length 2,252 m (7,388 ft) is the world's third longest cable-stayed deck; only the decks of the Jiaxing-Shaoxing Sea Bridge in Shaoxing, China and the Millau Viaduct in southern France are longer at 2,680 m (8,793 ft) and 2,460 m (8,071 ft), respectively. However, as the latter is also supported by bearings at the pylons apart from cable stays, the Rio–Antirrio Bridge deck might be considered the longest cable-stayed "suspended" deck. Charilaos Trikoupis was a 19th-century prime minister of Greece who suggested building a bridge in the current location but the wealth of Greece at the time didn't permit its construction. 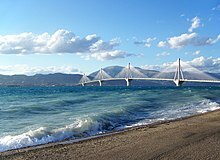 The bridge was planned in the mid-1990s and was built by a French-Greek consortium led by the French group Vinci SA which includes the Greek companies Hellenic Technodomiki-TEV, J&P-Avax, Athena, Proodeftiki and Pantechniki. The consortium operates the bridge under concession under its ΓΕΦΥΡΑ or ΓαλλοΕλληνικός Φορέας Υπερθαλάσσιας ζεύξης Ρίου-Αντιρίου (GEFYRA—Greek for "bridge"—or GalloEllinikós Foréas Yperthalássias Zéfxis Ríou-Antiríou, French-Greek Carrier of Oversea Connection of Rio–Antirrio) subsidiary. The lead architect was Berdj Mikaelian. Site preparation and dredging began in July 1998, and construction of the massive supporting pylons in 2000. With these complete in 2003, work began on the traffic decks with the steel fabrication being carried out by Cleveland Bridge U.K. and supporting cables by Freyssinet. On 21 May 2004 the main construction was completed; only equipment (sidewalks, railings, etc.) and waterproofing remained to be installed. The total cost of the bridge was about €630 million, funded by Greek state funds, the consortium and loans by the European Investment Bank. It was finished ahead of its original schedule, which had foreseen completion between September and November 2004, and within budget. Other sources talk about €839 million. The bridge was inaugurated on 7 August 2004, a week before the opening of the 2004 Summer Olympics in Athens. Olympic torchbearers were the first to officially cross it. One of them was Otto Rehhagel, the German football coach who won the Euro 2004 Championships for Greece. Another was Costas Laliotis, the former Minister of Public Works during whose term the project had begun. Due to the peculiar conditions of the straits, several unique engineering problems needed to be considered and overcome. The water depth reaches 65 m, the seabed is mostly of loose sediment, the seismic activity and possibility of tectonic movement is significant, and the Gulf of Corinth is expanding at a rate of about 30 mm a year. In addition, the hills on either side create a wind tunnel where 70 mph winds are common. For these reasons, special design and construction techniques were applied. Beneath each pier the seabed was first reinforced and stabilized by driving 200 hollow steel pipes vertically into the ground. The pier footings were not buried into the seabed, but rather rest on a bed of gravel meticulously leveled to an even surface (a difficult endeavor at this depth). 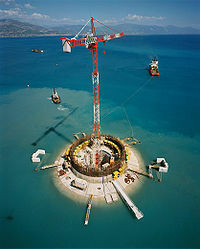 During an earthquake, the piers can move laterally on the sea floor with the gravel bed absorbing the energy. The bridge decking is connected to the pylons using jacks and dampers to absorb movement; too rigid a connection would cause the bridge structure to fail in the event of an earthquake and too much lateral leeway would damage the piers. There is also provision for the gradual widening of the strait over the lifetime of the bridge. Protection from the effect of high winds on the decking is provided by the use of aerodynamic spoiler-like fairing and on the cables by the use of spiral Scruton strakes. Elevation chart of the bridge. The bridge received the 2006 Outstanding Structure Award from the International Association for Bridge and Structural Engineering. In 2006 the bridge was featured in an episode of Megastructures on the National Geographic Channel. In 2011 the bridge returned to TV in an episode of Richard Hammond's Engineering Connections. In 2015, construction of the bridge was chronicled in the first episode of the Science Channel series Impossible Engineering. On 28 January 2005, six months after the opening of the bridge, one of the cable links of the bridge snapped from the top of the M1 pylon and came crashing down on the deck. Traffic was immediately halted. The first investigation claimed that a fire had broken out on the top of the M1 pylon, after a lightning strike in one of the cables. The cable was immediately restored and the bridge reopened. One specific element of the system is the ability to detect and specifically treat earthquake events. Photography by both professional and amateur photographers or cinematographers is allowed and encouraged by the bridge management without the need for a permit, with the bridge's management often organizing special events inviting professional and amateur photographers and cinematographers to photograph the bridge and the cars or the pedestrians using it. It has become a very popular landmark for street photography in Greece, with the local street photographers often showing in their photos of drivers and the pedestrians crossing the bridge. Sample of cable anchorage from the bridge museum in Antirrio. ^ "The Earthquake Proof Bridge". Richard Hammond's Engineering Connections. BBC. Retrieved 28 July 2016. ^ "Rion-Antirion Bridge". Structurae. Retrieved 28 July 2016. ^ "Project Profile Greece Rion Antirion Bridge" (PDF). Retrieved 28 July 2016. ^ "Specific Engineering Designs Used in Bridge Construction"
^ "ΓΑΛΑΝΟΛΕΥΚΗ ΓΕΦΥΡΑ: Απονομή μεταξύ θάλασσας & ουρανού". ΓΕΦΥΡΑ. Retrieved 28 July 2016. Wikimedia Commons has media related to Rio-Antirrio Bridge. Timelapse video of the bridge during Earth Hour 2011 Timelapse showing how the bridge switched off & on the lights during Earth Hour 2011.